Don't get caught up in focusing only on "pure plays." The global cybersecurity market is expected to boom in the coming years as organizations and governments scramble to protect sensitive data and systems from ever-evolving threats. According to one estimate, global cybersecurity spending will increase from $135 billion last year to more than $202 billion in 2021, a 50% increase. There are quite a few cybersecurity specialists for investors looking to take advantage of this burgeoning market, but one of them stands tall above the rest: Cisco (NASDAQ:CSCO). You might argue that Cisco isn't a pure-play cybersecurity company because its primary business is selling networking equipment such as routers and switches. But that is what separates Cisco from the rest of the field, and a closer look at the performance and size of its security business will make clear why it is one of the best bets in this space. Cisco's quarterly revenue rose for the first time in over two years in the recently reported second quarter. The 3% year-over-year increase was partly due to the growing contribution from the company's subscription business. This impressive performance sent the stock to a 17-year high. The company's turnaround wouldn't have been possible without the strong contribution from cybersecurity, which was one of Cisco's fastest-growing businesses last quarter, clocking 6% year-over-year growth. And this segment has grown 7% in the first six months of the current fiscal year, outpacing the overall growth in the company's revenue. Security might not be a big part of Cisco's overall business at present; it supplied just 4.8% of total revenue during the first six months of the fiscal year. But its $1.14 billion in cybersecurity revenue during this period easily eclipses pure-play rivals such as FireEye, Palo Alto Networks (NYSE:PANW), and Check Point Software. FEYE Revenue (TTM) data by YCharts. In fact, Cisco's half-yearly cybersecurity revenue exceeds FireEye's trailing-12-month revenue by a wide margin. And Cisco's annual amount should exceed Check Point's and Palo Alto's top line since it remains firmly on track to achieve more than $2 billion in revenue from this segment this fiscal year. What's more, the growth of Cisco's cybersecurity business is also boosting its recurring revenue. The company's recurring revenue increased 2 percentage points year over year during the fourth quarter to 33%, thanks largely to the massive jump in subscriptions for security services. More specifically, Cisco's deferred revenue increased 38% last quarter, and management attributed this to an increase in sales of software subscriptions. Deferred revenue is the revenue collected by a company for services that will be provided at a future date, and it will be recognized on the balance sheet when the actual delivery happens. 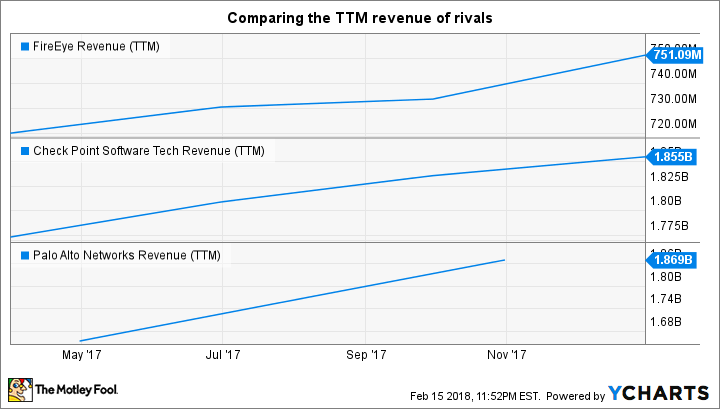 So, the rapid rise in deferred revenue is good news for Cisco as it points toward stronger top-line growth in the future. The rising contribution from recurring sources of revenue is also good news because it should indicate rising margins. Ideally, it costs less to service an existing subscription customer than it does to acquire a new one. So as customer acquisition costs fall, margins will rise. The increasing tilt toward subscription-based services is already boosting the company's gross margin. Last quarter, Cisco's gross margin increased 230 basis points year over year. Is Cisco the pick of the lot in cybersecurity? Cisco's rapid deferred-revenue growth also eclipses its rivals'. For instance, Check Point Software's latest quarterly report showed that its deferred revenue increased just 11% year over year. FireEye's deferred revenue increased just 2.6% year over year during the quarter including December. Palo Alto is yet to release its latest results, but it was the only one to have posted respectable deferred-revenue growth (37%) during its last reported quarter. However, Palo Alto's aggressive marketing means that it is still a loss-making entity. The company's net loss in the recently reported quarter increased 12.4% year over year despite a 27% increase in revenue. This is because Palo Alto spent over 51% of its revenue on sales and marketing in a bid to cut its teeth in the competitive cybersecurity space, and this hurts its bottom line. Cisco, meanwhile, spent just under 19% of its total revenue on sales and marketing in the latest quarter, and this is for all its business segments, including security. This puts Cisco above the rest because it can utilize its existing sales channels in the networking hardware business to undercut rivals. For instance, Cisco can bundle its security offerings with other products, lower the pricing, and carve out more market share. It recently deployed a new service known as Cisco Security Connector, which can gather all the network traffic generated by iOS devices and applications. The product then prevents the user from going to malicious sites. Moreover, this application can be deployed using Cisco's cloud-based enterprise mobility management software, which means that Cisco can simply push this new service to customers without spending a fortune. This strong cross-selling opportunity puts Cisco at an advantage over its cybersecurity rivals, which are spending a lot to acquire new customers. This is why Cisco's margin profile will be better than its rivals'. In all, Cisco's size and financial muscle allow it to quickly accelerate the cybersecurity business. Cisco looks like the best-of-breed bet in the cybersecurity space.